I have a 7 month Miniature Aussie that wolfs her food. With some treats she seems to swallow it without a single bite. Is this normal? Our 5 year old terrier mix is a leisurely eater and presents no challenge to the puppy for food. We have the same problem here. 6 month gobbling her food 4 1/4 year old relaxed eating. 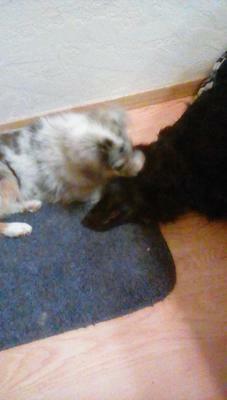 Both Aussies both female. Ended up putting a tennis ball in a small bowl with her food, so she has to eat around the tennis ball. Has slowed her down a bit. We can't give the 6 month old bully sticks to chew-she has swallowed a bully stick was almost whole. She was making a coughing sound every once in a while, so I gave her a little vegetable oil on a teaspoon. She expelled a almost whole bully stick. Learned the vegetable oil treatment from my Vet. I have a 4 month old pup and he literally was inhaling his food. I purchased a food dispensing ball on Amazon that he has to work at. Not only does it take him 15-20 minutes to eat his food, it is great mental stimulation. Hope that helps.